On-site storage to keep your bike dry and safely locked. Walker Street offers 175 en-suite bedrooms with double beds, providing real student luxury. 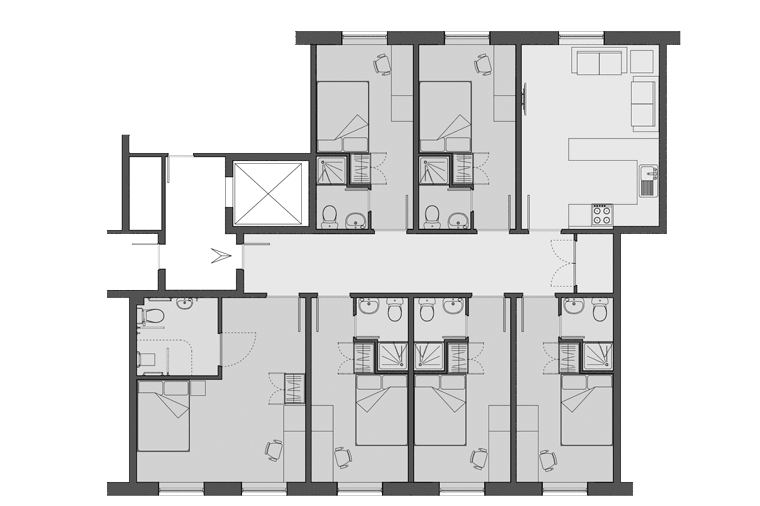 Flats are available with three to six bedrooms, all with a shared kitchen, breakfast bar and lounge area with leather sofas and a large flat screen TV. All of these features and more make this the most stylish student accommodation Preston has to offer. We've also got the essentials covered. Walker Street offers on-site laundry facilities, CCTV and secure electronic entry as well as caretaking services and 24 hour maintenance support. You'll also enjoy free contents insurance, all inclusive utility bills, Wi-Fi throughout and 50Mbs Broadband so you can relax and enjoy living at Sanctuary Students Walker Street. Our main Preston office is fully staffed and is located just around the corner at Moor Lane Halls. Living with Sanctuary Students, you'll also be welcome to use the Moor Lane Halls common room complete with table football, pool table, games machines and extra large flat screen TV with Sky. Walker Street students also enjoy free gym membership for the gym at Moor Lane Halls. Walker Street is adjacent to the University of Central Lancashire campus, making this accommodation perfect for enjoying all that Student life in Preston has to offer. Walker Street student accommodation is in a perfect location, just around the corner from University of Central Lancashire. 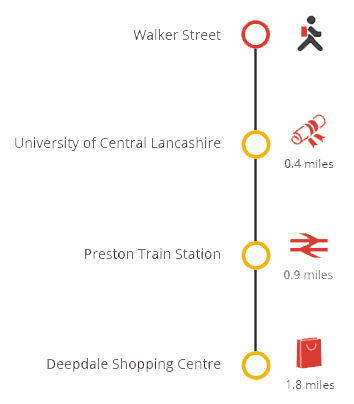 UCLan is a lively and friendly university with a growing international presence and at Walker Street we welcome students from across the globe. The accommodation is a short walk away from Preston's most popular student bars and pubs, including The Adelphi and Roper Hall. The UCLan Sports Arena is within walking distance and hosts a wide variety of sports teams, while Deepdale Football Stadium, home to Preston North End football club, is just 20 minutes away. The city centre has a wide range of high street shops which can be reached within five minutes, with a wide range of takeaways and shops on the adjoining street. The local supermarket is just five minutes away. Preston also has great transport links, and the train station is a five minute walk from Walker Street. Building-wide Wi-Fi and Ethernet broadband service are included in your rent and offers you a reliable and secure internet connection suitable for all your academic and personal needs, including browsing the internet, sending emails, downloading and streaming. You’ll need to check in at the reception at Moor Lane Halls, which is at the front of the building. Don’t worry if you’re running late; just let us know in advance so we can leave the keys with our security guard. When you check in we’ll ask you for some photographic ID (driving license or passport would be best). You’re the only person who can collect your keys unless you’ve written to us in advance to advise us that someone else will be picking them up on your behalf. There’s no parking on site so you’ll have to use local car parks on move-in day. We advise that you pick up your keys from Moor Lane Halls first before heading to Walker Street and unloading your car. During the last 45 days before the start of your tenancy – you will only be able to cancel this agreement if a suitable replacement tenant is found to take your place. Either you can find a suitable replacement tenant yourself, or we can find one for you. However, if it is left to us, we will only do this after all our other rooms have been let. In either case, there will be a reasonable administration charge. Note: If no replacement tenant is found, you will be responsible for payment of the rent in full, even if you do not move into the property. If you wish to cancel this agreement, you should let us know as soon as possible. Written cancellation/refund requests should be made to your on-site team. Refunds are normally processed within 14 working days. The Sample Tenancy Agreement (PDF 482KB) details the terms and conditions of your contract with us. Walker Street now benefits from LaundryView which will make doing your laundry on-site even easier. The system, created by Circuit, allows you to go online and check the availability of washers and dryers in your building as well as see when other washes are about to end.